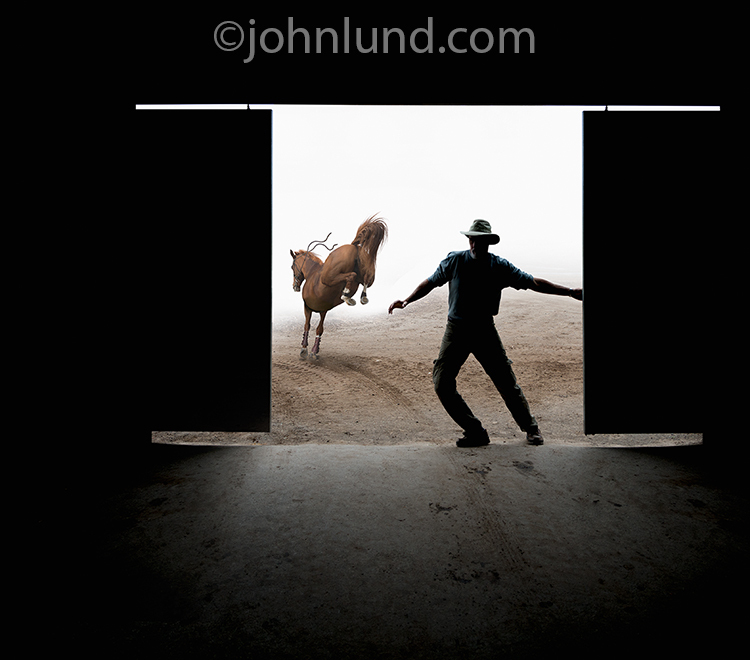 A man closes the barn door after the horse is gone in this concept stock photo about prevention, timeliness and procrastination. After thinking about it for about two years, I finally got around to taking some photos of a friend, Pippa Murray, while she worked her horse. I spent about an hour shooting while she was being coached on jumping her horse, and getting some pretty good material for my stock imagery in the process. As usual, when I shoot for stock, I went in with a shot list that included “shutting barn door after the horse is gone”. As Pippa was prepping and grooming her horse Bella, I had Stephanie, my partner, grab a quick shot of me pretending to pull the sliding barn door shut. 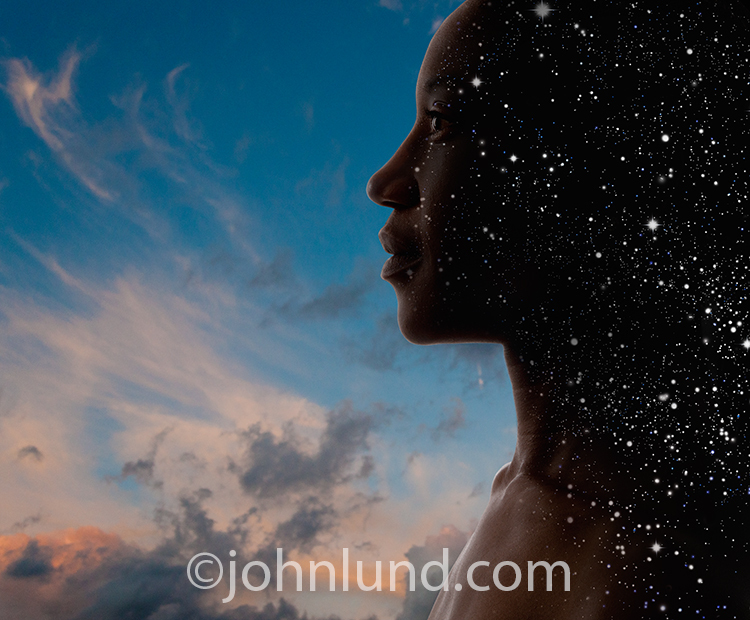 Back in my studio I went over my material, picked one of the “door shutting” images and brought it into Photoshop. I used the pen tool to create a clipping path on the inside of the barn door opening. I excluded both myself, and the barn doors, from the clipping path. I then made a selection with the clipping path using a one-pixel feather, inverted it, and used the selection to create a new layer. This gave me a layer that included everything except the background. Going back to the original background layer I applied a layer mask “reveal all”. After creating a new background (bottom) layer of white, I used a large soft brush to fade away the original background layer making the image look as if the scene outside the barn were overexposed and “blown out”. The next step was to add the horse. Should Have Brought That Shot List! Naturally, when shooting Pippa riding her horse I neglected to shoot specifically for my barn door image (should have brought my shot list and checked it off…so lazy! ), so I had to improvise. I did get a few images of her and Bella clearing jumps from behind…but only a very few. Those images stood out though because when jumping the horses’ rear hooves, in their highest position, gave the animal a lot more sense of action and added a bit more of a humorous feeling. The only problems were that the horses’ front two legs were obscured by the jump, and Pippa’s leg and saddle obscured a lot of the horse’s side. It took about three hours of work to make the horse look the way I needed it to look by cloning, copying and pasting and so forth. One never knows if an image is going to sell in stock, let alone do well, but I believe this photo has a lot of the qualities that make for a successful stock image. First of all, I think it is a concept that can apply to a lot of messages. The idea is one of prevention and of timeliness. “Have You Backed Up Your Data” could easily be a headline that would go with this photo of an escaping horse…after the barn doors are being closed. In fact, there are a ton of businesses, services and products that are designed to help us prevent bad things from happening or help us deal with such events including everything from firewalls to insurance to training. In addition, prevention is a difficult concept to illustrate making this image one with less competition. The potential is there for a good selling image. Humor is also a plus for this shot. Any time you can inject a little humor into an image you dramatically increase it’s chance for sales. The humor here is a little subtle, but I think it is hard to avoid smiling when you see the photo. The semi-silhouette lighting adds both drama and plenty black areas providing copy space for headlines and text, and the image is easily cropped square, vertical or horizontal. I wrestled with whether this should be a Rights Managed or Royalty Free image, but finally went with Royalty Free because I think the shot can be used to advertise so many different products and services and for a lot of editorial uses as well. With this image I am counting on the large market of Royalty Free users will pay off more than the SOMETIMES higher fees of Rights Managed. Time will tell! 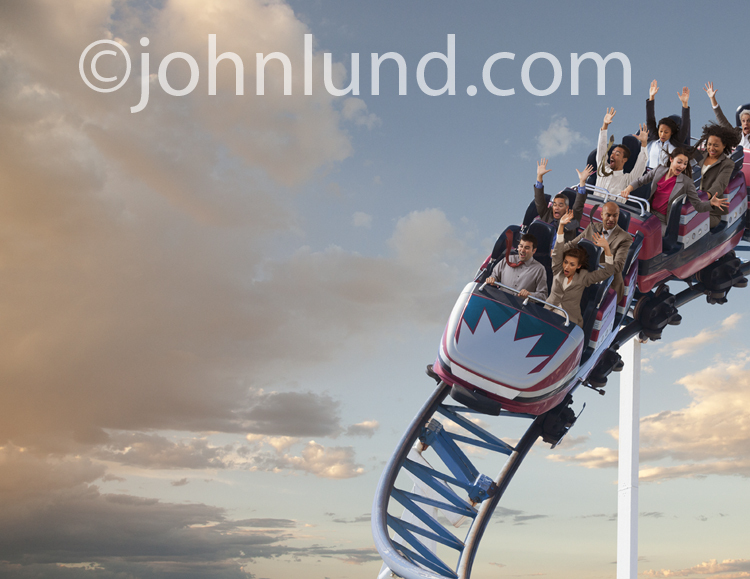 The stock photography business has become a roller coaster of ups an downs, but some photographers are still doing well. I just read a post on a forum in which a photographer complained about his sales (or lack of sales) at Alamy and is going to pull all of his imagery. Everywhere one turns photographers are decrying the state of the industry. I can’t even count how many photographers I have heard give up on Getty and Corbis. Even microstock photographers are hating on iStock (formerly iStockphoto) and Shutterstock. There is no doubt that these are challenging times in the stock photo industry, but I think it is important to keep in mind that the ones we hear from most are the ones who are having a hard time. The shooters who are experiencing success are for the most part eschewing the forums to…drum roll…make images! There are photographers who are succeeding in stock. So while that one unnamed photographer is pulling his imagery from Alamy, Jon Boyes has found a formula for making Alamy pay well…and is experiencing increasing sales. Cristian Baitg is finding success with iStock. Others I know are growing their sales at Getty (I can’t speak to Corbis as I don’t personally know anyone who is an active Corbis contributor). Even the upstart agency Stocksy, with just a few months under its belt, is claiming that several of their photographers are making good livings (though I would sure love to know exactly what that means….). 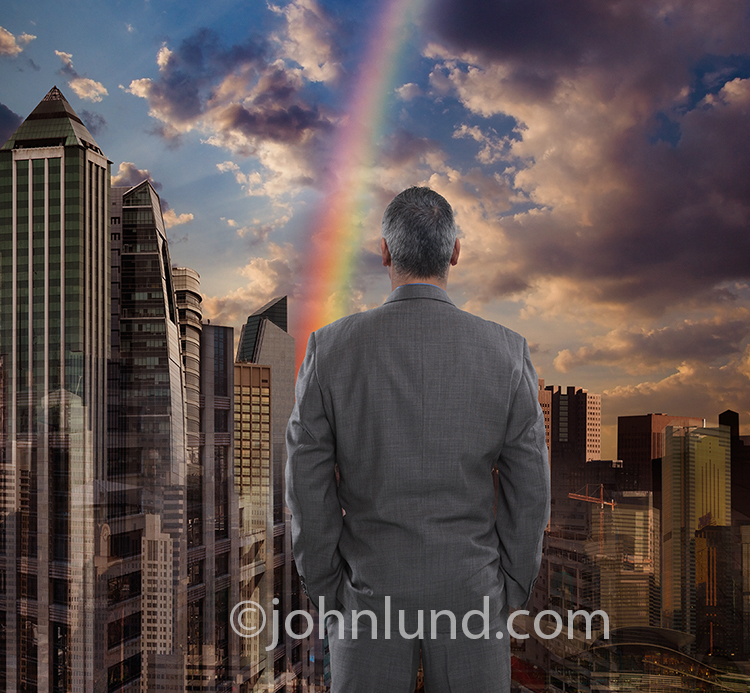 I am also aware of many Blend Images photographers who are doing well. My point is that we photographers can still make stock work for us, but need to understand what model suits our particular abilities and style. Jon Boyes, for example, has the patience and discipline to understand and make the most of key wording at Alamy. Cristian Baitg knows what works, and how to shoot it, for the micro model. I hear photographers say their RM imagery is doing well but that they are giving up on RF…and I also hear the exact opposite. I know at least one photographer who has given up on Getty to shoot microstock! I personally am experiencing what I am sure many other shooters are…a roller coaster of up and down months. One month I think things have turned the corner and the future is rosy, the next I have to grit my teeth and not let a disappointing sales report interrupt my productivity. When you hear the sky is falling, take it with a grain of salt and learn as much as you can about your own situation and what will work for you. To succeed in stock photography these days it certainly helps to understand which agencies offer what. Getty, for example, is still the 600 lb. Gorilla, but is not offering much in the way of individual art direction. Blend Images (disclaimer…I am a part owner of Blend), as another example, offers vast distribution and individual art direction. Shutterstock boasts a huge customer base, but certainly isn’t right for my style of imagery…at least not “as right” as Getty or Blend. On top of everything else agencies are going public, venture capital is coming in, and agencies are jockeying for position with renewed vigor. Change is afoot and it may be very important to pay attention to it! Each of use needs to really understand what to shoot, how to take advantage of our own skill sets and shooting styles, and which distribution channels work best our own circumstances. 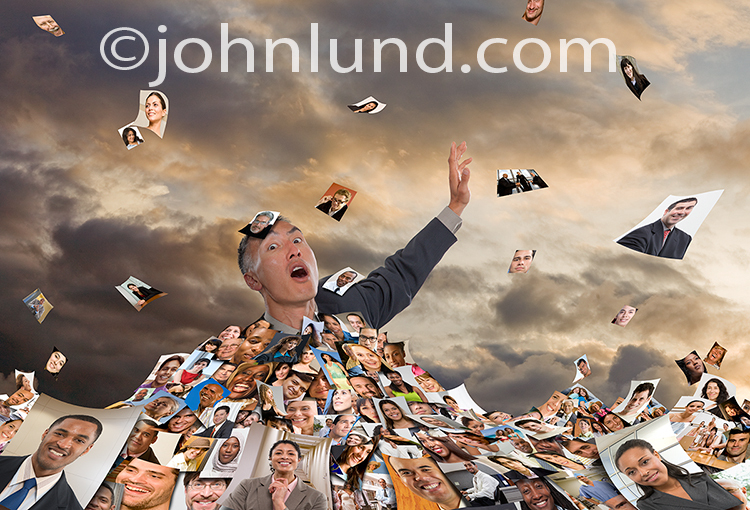 If we can understand those things we can still thrive in stock photography...it just isn't easy. A bridge to nowhere, or the way forward to opportunity? 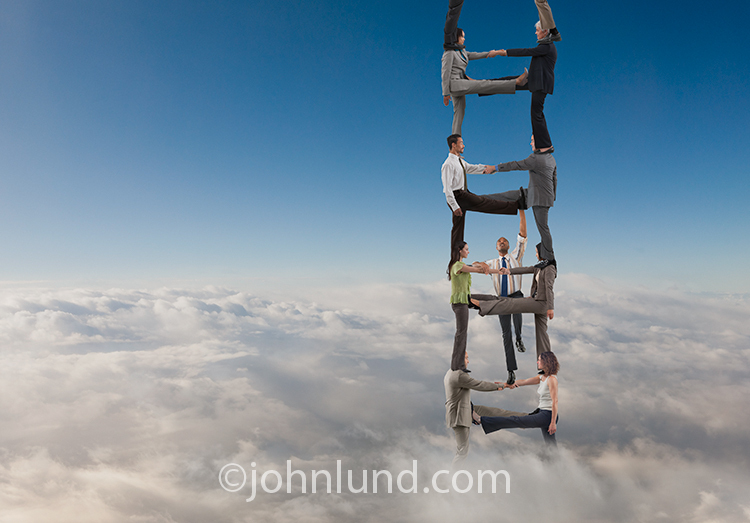 This concept stock photo is the result of a collaboration between the photographer and his stock agency. A couple of weeks ago Blend Images asked me to work on some concept stock photos. One concept they asked me to undertake was that of “Supply Chain”. 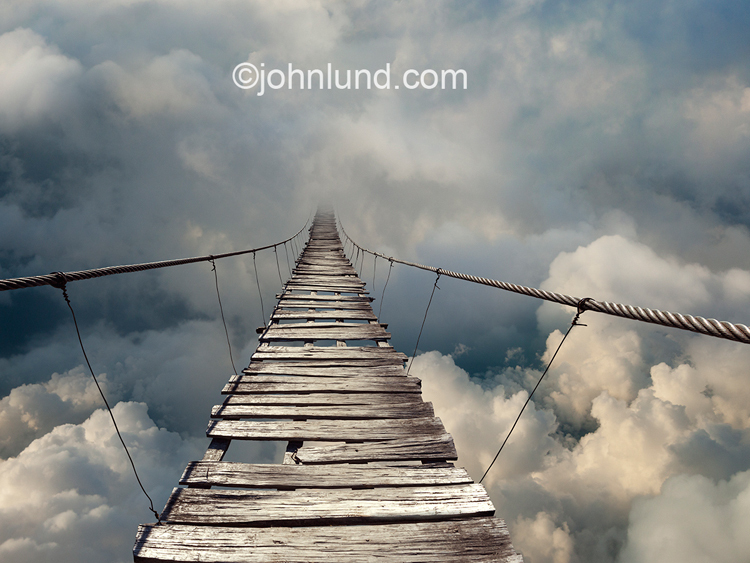 As I thought about what I could create to illustrate that concept this bridge image that I had captured on a trip to Myanmar sprung to mind. I liked that the bridge was rickety and near failing and could represent the adversity and challenges that face most supply chains. I went through my archives and found the image. The existing background was very uninteresting so I decided to strip the footbridge out and put it in a much more dramatic setting. I decided to create a clipping path using the pen tool and have the isolated bridge on a separate layer. Then I could simply try differing backgrounds till I found the one that worked the best. It took me about an hour, give or take a few minutes, to create the clipping path and put the bridge on it’s own layer. I went back to my archives in search of just the right background. It didn’t take me long to realize that having the bridge simply disappear into a cloudbank would be great. I used a combination of San Francisco Fog banks and high-altitude cloudscapes to create my ideal scenario. The whole effort from clipping path to finished image only took a few hours. I was pretty excited with the image, which I realized had a compelling drama as well as enough flexibility to apply to a wide range of concepts. 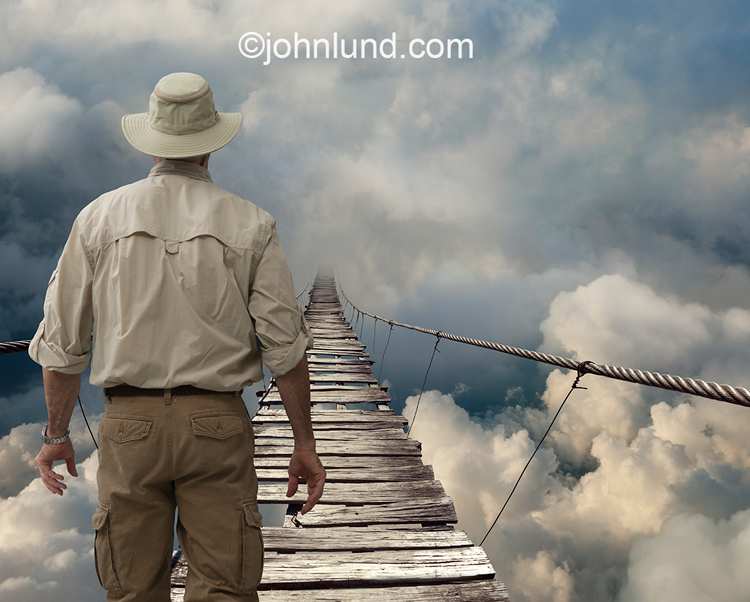 This version of the footbridge was before my agency art director suggested adding a person, and while it is still a great image, adding a person takes it t hat extra step. Next I sent a low -resolution jpeg to my art director, Jim Dougherty, at Blend. He quickly replied that I should try adding a person to the image, perhaps a figure crossing the bridge. Looking back it seems like an obvious option, and yet without the input of my editor I wouldn’t have tried it...I was pretty darn happy with the image the way it was. In fact, when Jim first suggested that I try it I was a bit doubtful. I figure it might actually limit the sales opportunities...I really like how the bridge without a figure seemed so open to a wide range of concepts. But one thing I have learned from thirty years of being a professional photographer is that I don’t have all the answers. The next morning I went in to the studio, set my camera up on the camera stand and used the self- timer to photograph myself in a variety of standing and walking positions. I ended up silhouetting myself out in three different positions. I began with having the model (me) just about to enter the fog bank, and then I began trying different scenarios. None of them were really working for me. Finally, I just added myself in the foreground to look as if I am contemplating an attempt at crossing the bridge. That was it! Originally I was thinking this would be a Rights Managed image. A lot of work went into it...a full day of photography and imaging not even counting the original bridge image shot in Myanmar. And yet, I could see so many potential uses from the risks and dangers of “Cloud Computing” to such tried and true concepts as “The Way Forward”, The Future, and “Journey’s”. Add to that the fact that as an RF image I can also include the original bridge photo sans model, and I decided to go Royalty Free. This is just one example of how working closely with an agency can pay off. Every photographer works differently with their editor or art director, but however one works with them, it is important to take advantage of their knowledge. As photographers we see only a very small part of the big picture. Art Directors such as Jim have the advantage of knowing what the gaps and needs of the agency collection are as well as having access to a ton of market research. They see the work coming in from numerous other photographers as well, which helps them understand where an individual photographer can fit in and maximize their own strengths. As stock photography continues to get increasingly competitive it becomes ever more important for photographers to hone in on the needs of the market and to minimize wasted efforts that are duplicating existing work or aimed at non-existent needs. Working closely with an agency can help photographers make the most of their time and resources and help them fine-tune their photography to make it the most effective it can be. Attitude is Everything! Too many stock photos? Be inspired! I make a conscious decision to be inspired by my fears rather than to drown in depression. I made this image for Blend Images. Sales reports can be a great source of depression as well. On my last sales report I had a 5-cent royalty for an RM image. I also had a $1,500.00 canceled sale…and that sure doesn’t help my frame of mind! A few days ago I spotted one of my still images in an ad on television. It is a little hard to spot because it is one of many images used and goes by in the flash of an eye…but nonetheless…there it is on television. It is an RF image which means it is kind of hard to track down how much I got paid for the image…but the largest sale for it in the last several months is $14.00. Swell. Waiting for images to go up is another great way to ruin an otherwise good day. Images occasionally get lost, often take forever to get online, and get rejected for ridiculous reasons. My favorite “lost” image story happened with Getty. I submitted an image, forgot about it, and it popped up one day in my collection…three years after I submitted it! It sells pretty well…and is a tad depressing thinking about all the sales I missed out on during those three years! I have been watching Corbis lately and while I may be exaggerating, it feels as if I haven’t had a new image go up there in months! 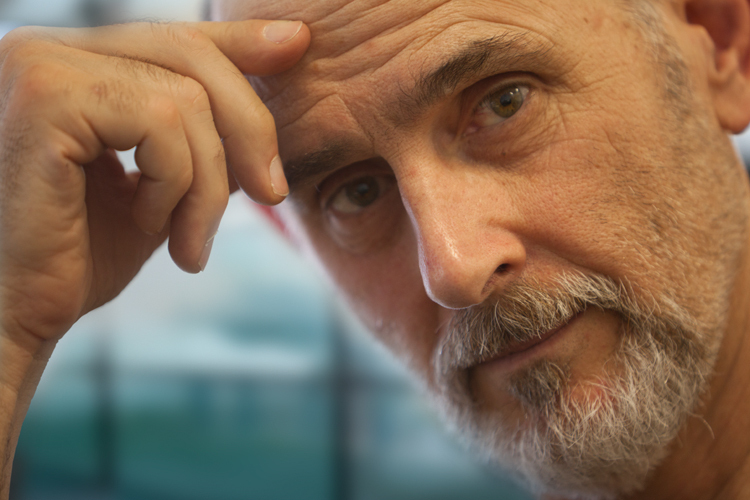 Though I did see a Corbis image of mine used in the Wall Street Journal yesterday that might net me anywhere from $1,000.00 to $5.00…who knows (do I seem a tad bitter today?). My point here is on the importance of attitude. If I let all that stuff get me down then my productivity will surely follow in a downwards arc. Instead of being depressed at the vast number of awesome images out there I need to be inspired to create even better ones of my own. 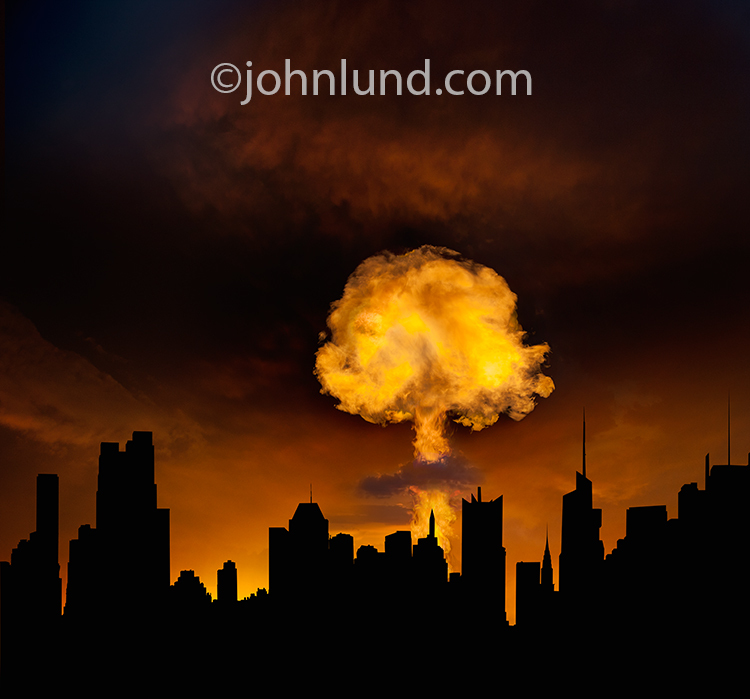 Rather than being depressed by the endless waves of mediocre, or worse, images that threaten to drown out my own sales, I need to have the resolve to create images that are so on-target, relevant and visually interesting that they rise above the vast morass. The emotional shock of a low sales report is energy I can use to motivate myself to create new work. “I’ll show them” is a lot more productive than “Why bother?” Any of us who have participated in stock photography for any great length of time know that there are up months and down months…and that the up months have gotten progressively more challenging to achieve. But those up months are still available provided we have the motivation not just to create new images, but also to do so in a very thoughtful way. We can no longer afford to just create images, now we have to pay attention to what the market needs and wants and where the buyers are going. One of the few things we can have control over is our own attitude. By making a conscious decision to have a good attitude we can turn negatives into powerful positive forces. Despite the constant barrage of arrows and darts that seem to continually find me, I am still making a good living at stock photography, and when I don’t allow myself to succumb to negative emotions I realize I still am having a great time creating fun images and enjoying the community of my fellow stock shooters.